Hell Is Where You Make It. Krakow, Poland. 1st June 2014. Arriving in Krakow, I booked into the hostel. The guy on reception asked me where I’d come from and when I told him he said ‘What were you doing there, are you interested in mining history or something?’ It seems Silesia isn’t the most favoured part of the country. I told him I’d been to see the castle and he still didn’t seem all that impressed. Next morning, after sleeping badly due to my noisy room mates, I set off to the town of Oswiecim, better known to the world as Auschwitz. I don’t propose to tell the story of the death camps here. It’s been told often enough for everyone to know it and there’s no need to repeat it. So I’ll stick to talking about my visit, add some information that maybe isn’t so well known and a bit of an overview. I’ll also include photos, some of which may be upsetting. The Nazis built a total of 20,000 concentration camps of all types of which 8 were death camps, where about 3 million Jews died. 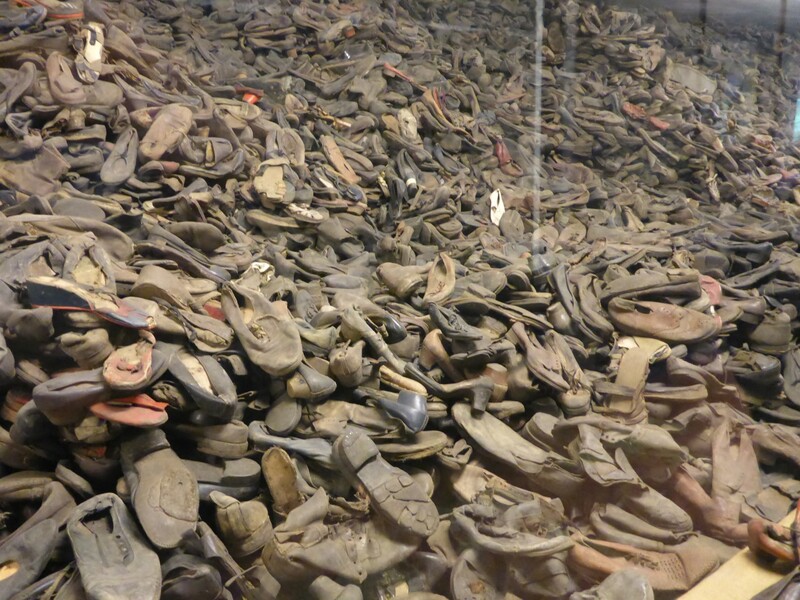 There were no Death Camps until the Nazis developed what they called ‘The Final solution to the Jewish Question’ and the death camp system was put into effect from July 1942, although the decision to use them was taken in January of that year. Up until this time most Jews had been herded into Ghettos and used as forced labour. 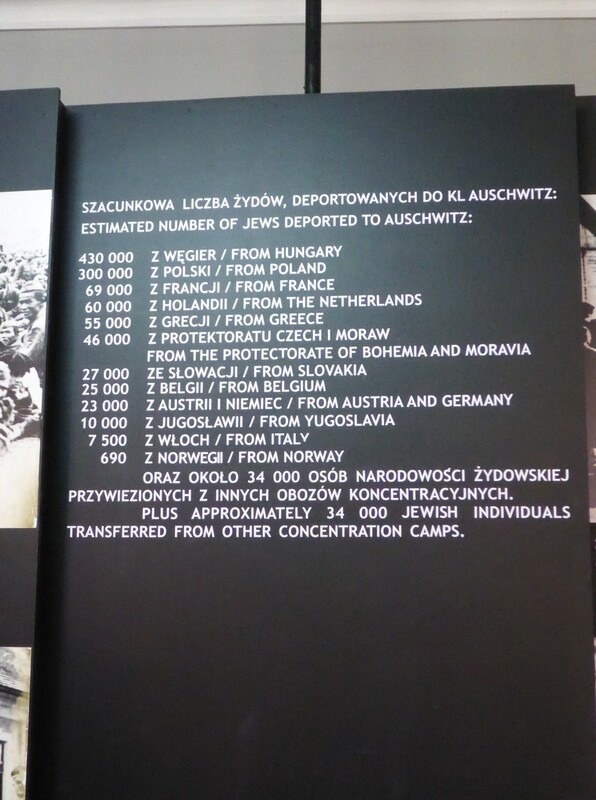 However, the extermination of Jews began before the death camp system. There was a plan to take the killers to the Jews which pre-dated taking the Jews to the killers. The occupied USSR was mostly where this method was used. The Nazi’s target was to exterminate all of Europe’s 11 million Jews, including those in the UK. Auschwitz I started life as a standard Polish Military Barracks but when the Nazis took it over after the invasion they set about extending it and adding new buildings. The prisoners there were mostly Polish but also included Russian POW’s and others. After the invasion the Nazis rounded up any Poles who they thought capable of organising resistance, such as civic leaders,businessmen, boy scout leaders.They were used as forced labour to work on the buildings. They were treated appallingly, often left standing outside for roll calls for up to twelve hours. The food was very poor and people died from malnutrition as well as from beatings and executions. The infamous slogan: Arbeit macht Frei -Work Makes You Free. Who died and from whence they came. A word about the camp. 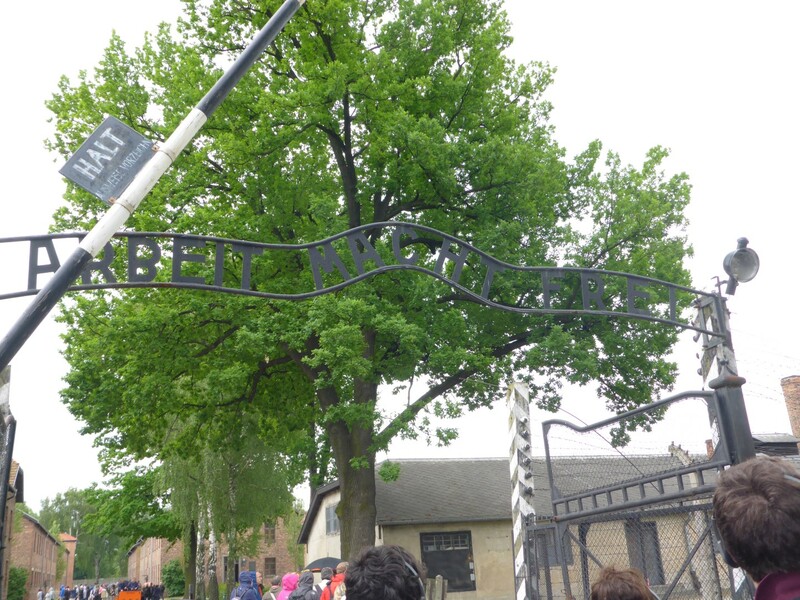 There were two other camps – Auschwitz II Birkenow and Auschwitz III Monowitz. Monowitz was a labour camp associated with IG Farben, the chemicals company that manufactured Zyklon B. There were also 45 satellite camps. It’s quite appalling to think of Jews working in the factories that made the gas which killed other Jews. 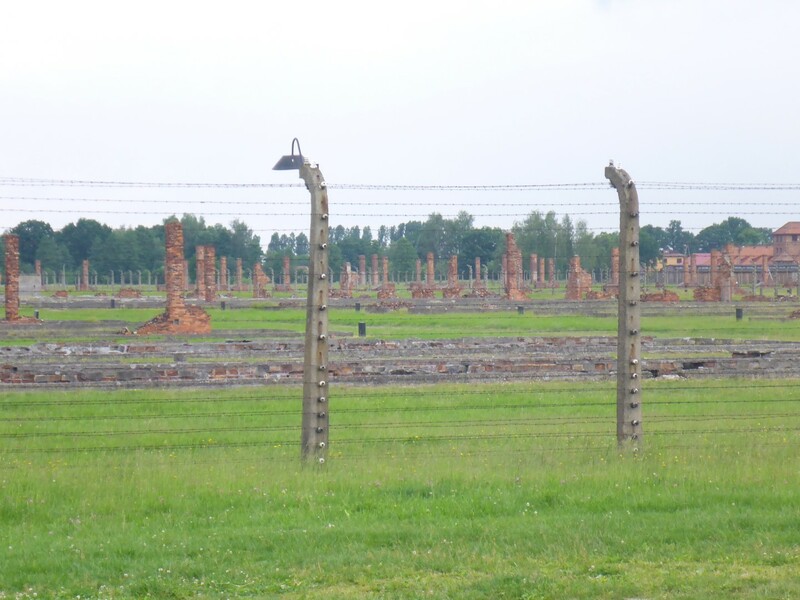 The Nazis put in place a 40km exclusion zone and moved all Poles out of the villages within it. The houses were either given to officers to live in with their families or were pulled down. That left them room to build the other two camps. I had just missed the 11.30 tour so had to wait until the next English speaking tour at 12.30. In the meantime I had a snack and chatted to some lovely lively ladies from Liverpool. The tour cost is about £8, very reasonable for a tour that lasts up to four hours. I was given an audio headset so that I could hear our guide, David Kennedy as we walked round. 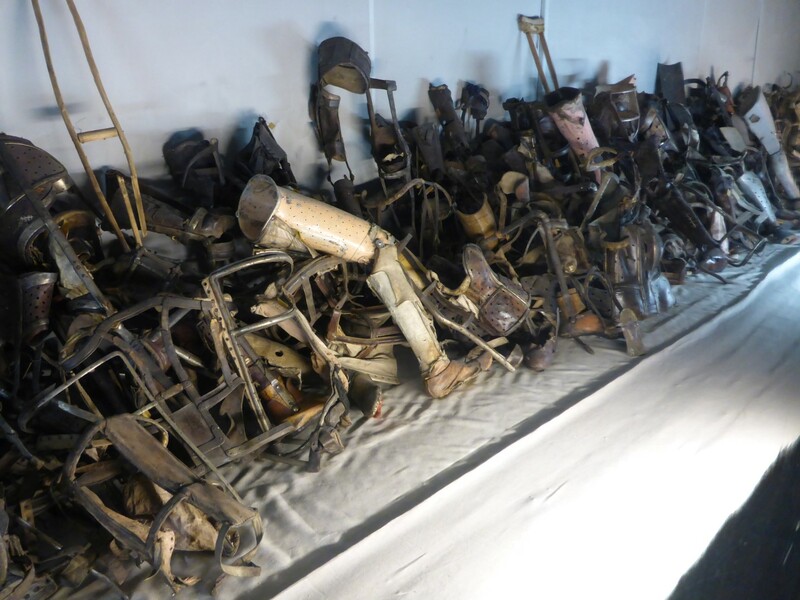 We started the tour in Auschwitz I and were told that it was the survivors who decided what the museum should contain, what should be shown and whether or not buildings should be altered. That is a comforting thing to know as it it makes the tour feel less of an intrusion into unknown people’s tragedy and more of an invitation to learn their story. Building which housed the original Polish prisoners. 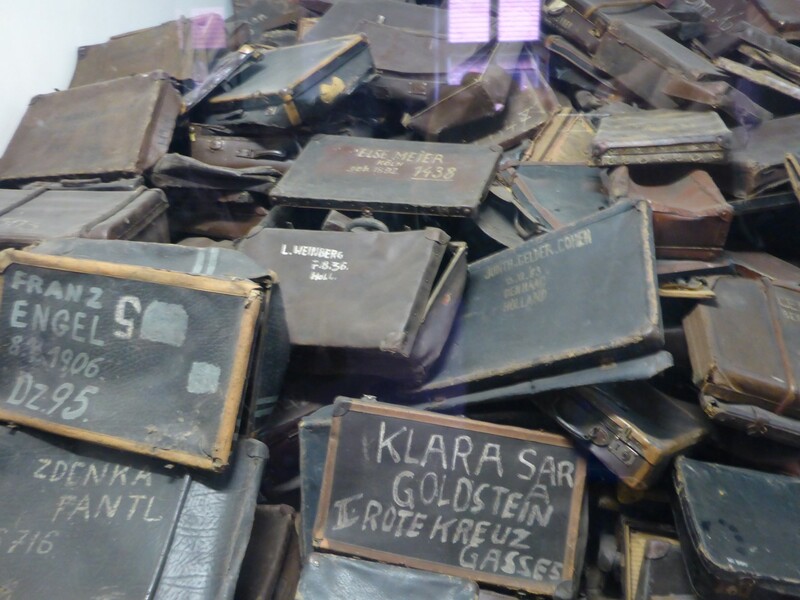 We toured around the various buildings and without any doubt the most distressing displays were those of the possessions of the murdered Jews piled up in the display cases, by far the worst being the hair shorn from their heads before being gassed. 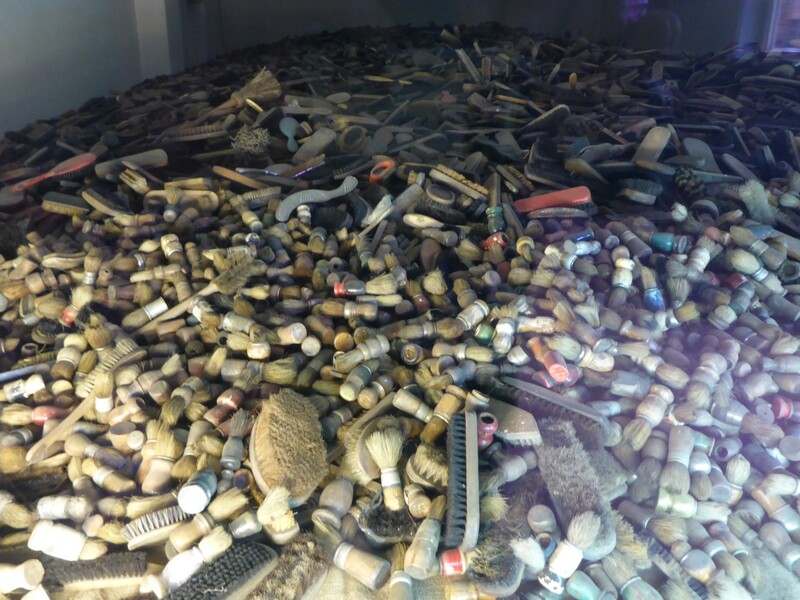 I was amazed to learn that many of these items were recycled back to the civilian population. Because German industry was on a total war footing it became harder and harder to get domestic items. So I suppose a clean and disinfected Jew’s cooking pot, pair of shoes or even toothbrush was better than none. I hope that the German population didn’t know where these items came from, but who knows? The SS guards would always keep boot polish for themselves. Artificial limbs by the hundred. Personal hygiene items by the thousand. We went to look at a reconstructed gas chamber and crematorium which showed how the murders took place and how bodies were disposed of. 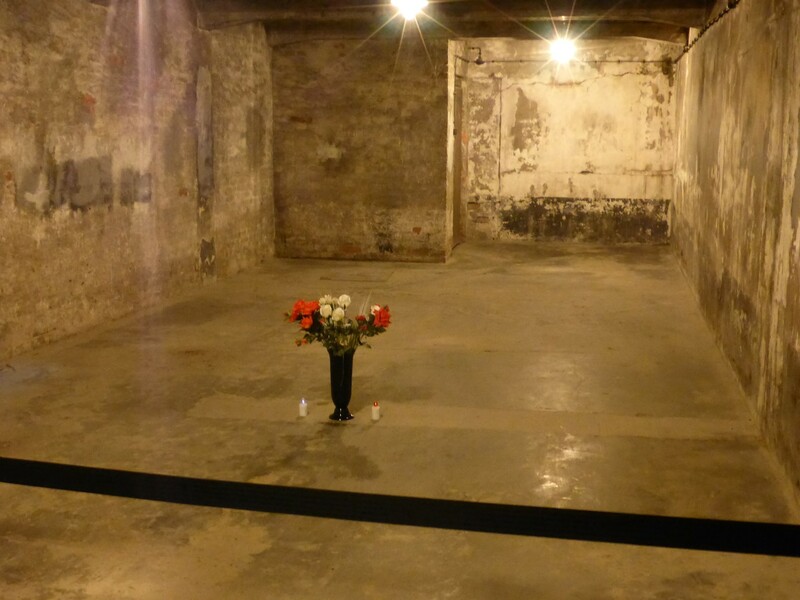 We also saw the accommodation blocks and punishment cells, not so different from what I’d seen in Terezin. 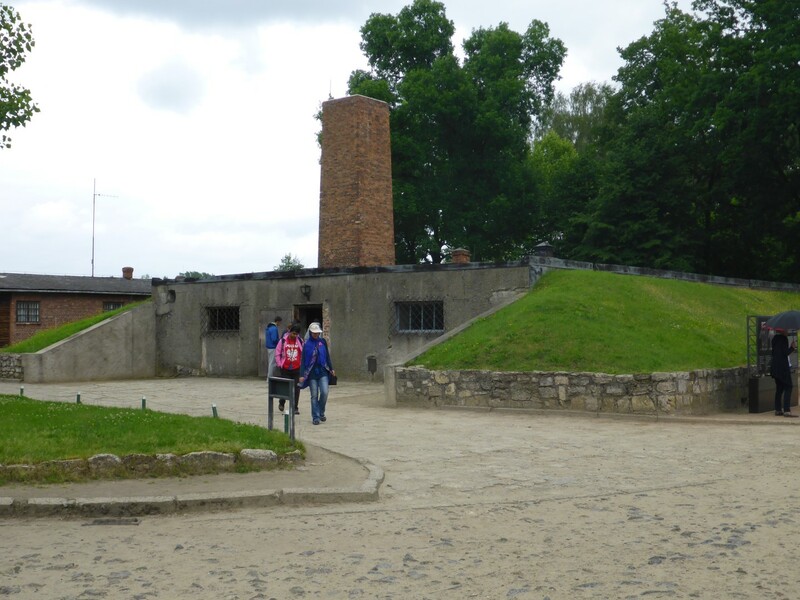 Gas chamber and crematorium from the outside. Gas chamber from the inside. 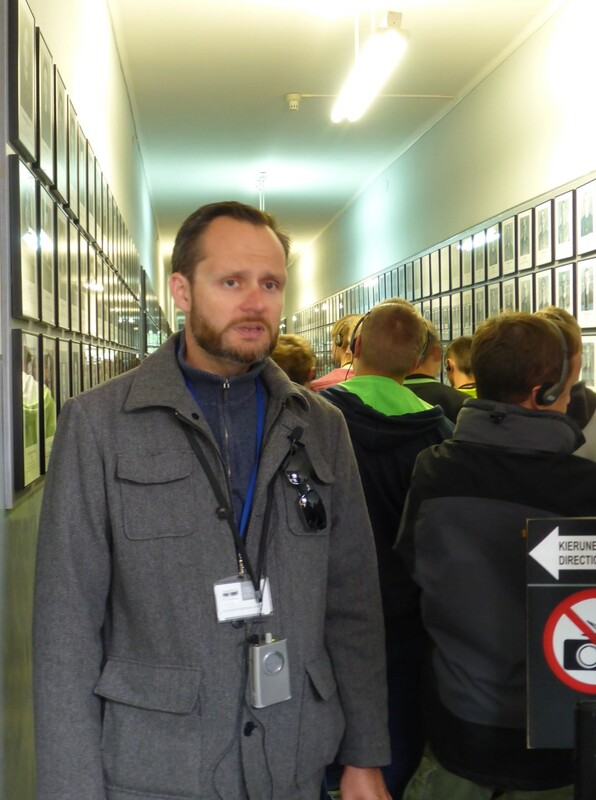 There is a shuttle bus to Auschwitz II-Birkenau and on the way over I started chatting to our guide, David Kennedy who comes from Wisconsin. I was puzzled as to why an American, with no Jewish heritage, would be working here. He told me that his grandparents were Polish and because they had skills that the Nazis needed were forced to work in some of the workshops associated with the camp. I also asked him how he dealt with telling people the dreadful history of this place without suffering constant depression. He gave me two answers, both of which I can relate to. Firstly, he feels good about educating people on the subject and secondly he enjoys messing about with cars which gives something completely different to concentrate on. He has a very neutral style of delivery, professional, measured and non-judgemental. Entirely suited to the situation. I mentioned to him my visit to Lidice, in Czechia. He said, terrible though that was, the Nazis did that kind of thing as a matter of routine in their advance across Poland and into Russia. It was their way of neutralising any resistance in the areas they occupied. How awful. 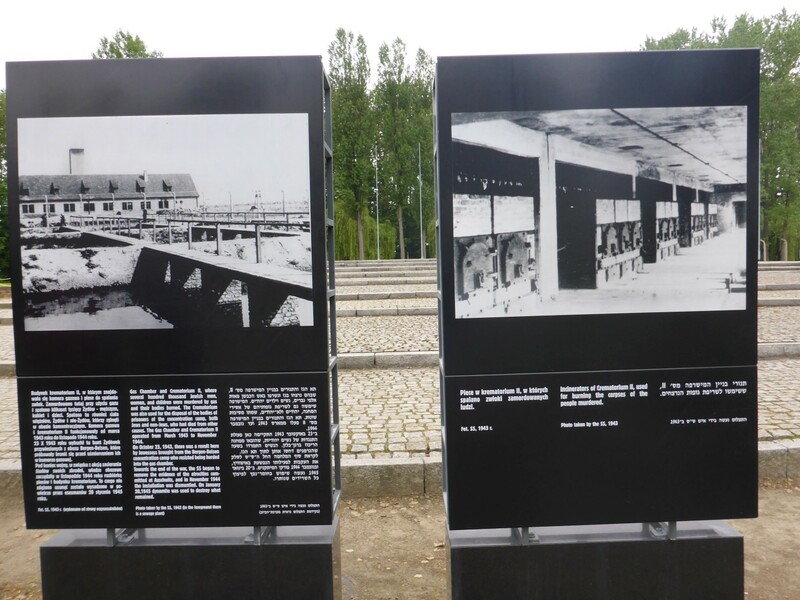 The rail lines that took Jews into the camp. 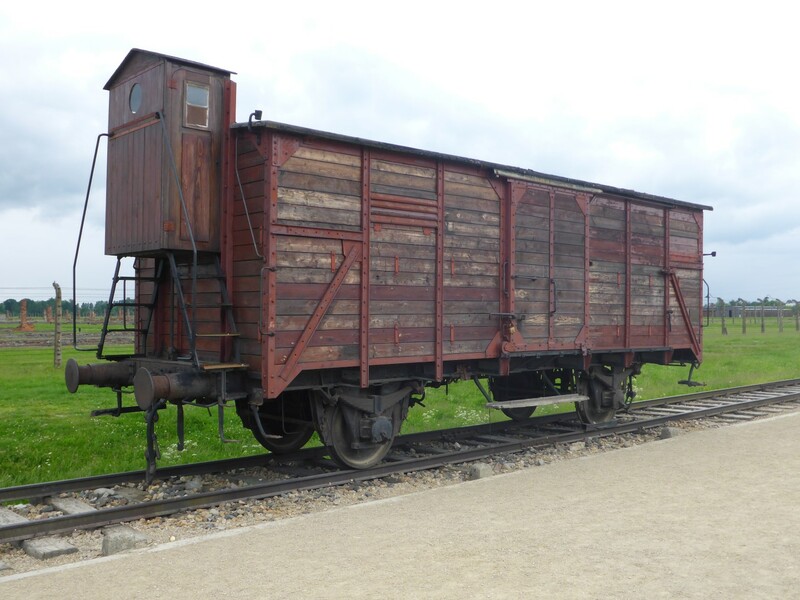 One of the wagons they were transported in, for thousands of miles, standing up and with very little water. 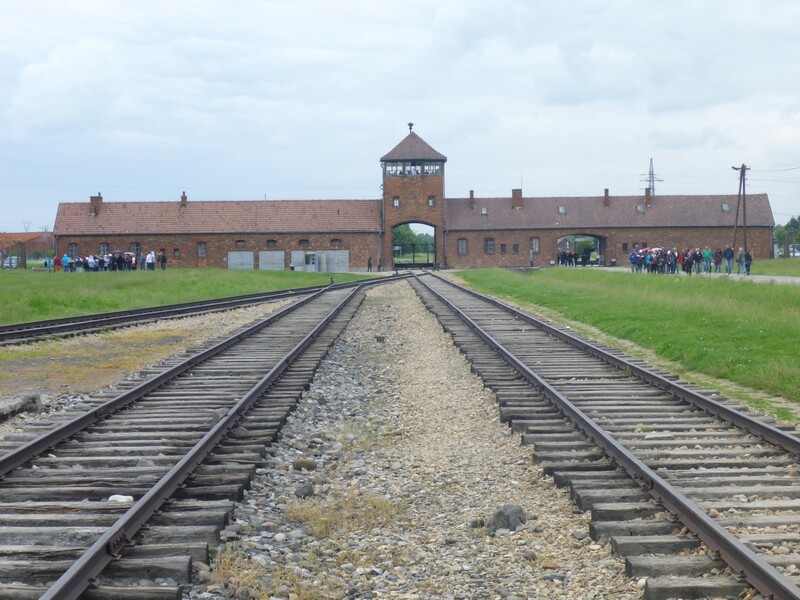 The thing that struck me most about Auschwitz II is the sheer size of it. It’s vast. There is a central road and the men’s and women’s accommodation buildings were on either side, stretching away into the distance. 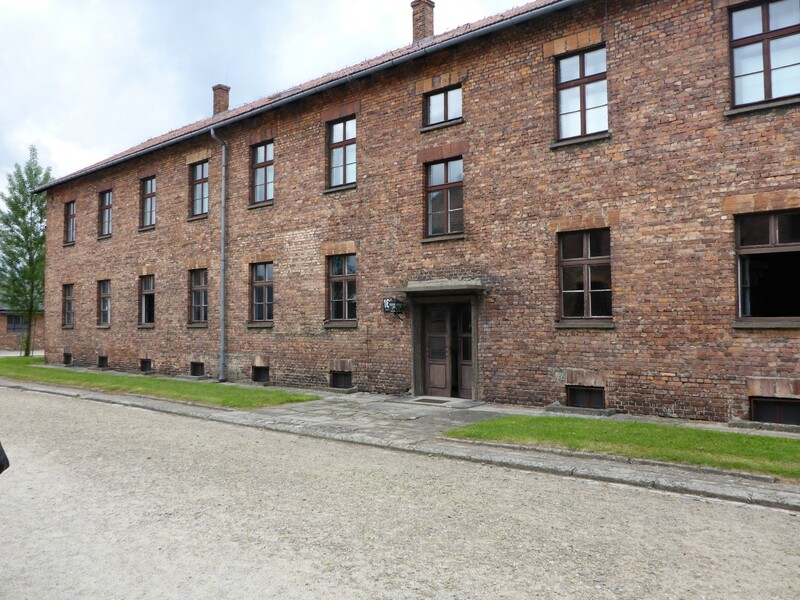 Almost none of the men’s buildings remain because, being made of wood and therefore easily transportable, they were sent to Warsaw and other cities to provide civilian housing. The war had destroyed almost all the housing. All that remains of the men’s blocks is the fireplace and chimney. Looking across the field all I could see was rows of these remains, standing there like sentinels guarding the memories of those who died there. The camps were vast. Fireplaces and chimneys are all that’s left of the wooden buildings. The women’s block were brick built so most of those are still standing albeit mostly in very poor condition. The area is the flood plain of the Ustule River so the ground is quite wet. However, we could look into some of them. 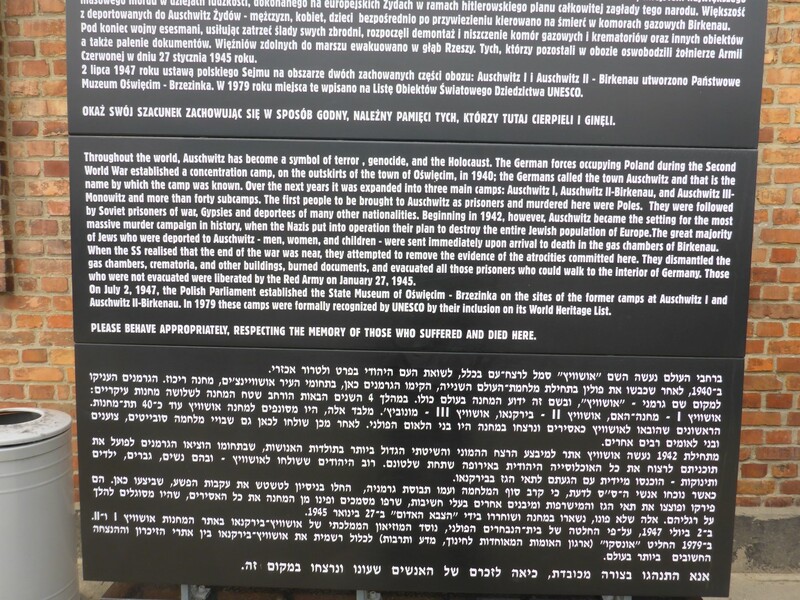 There is a direct link between Terzin camp and Auschwitz in that when the Nazis invited the Red Cross to examine Terezin they sent many of the prisoners there to Auschwitz so that it didn’t look too overcrowded. Most didn’t return. Finally, we went to look at the memorials that had been erected to those who died. These were just across from the place of their death. 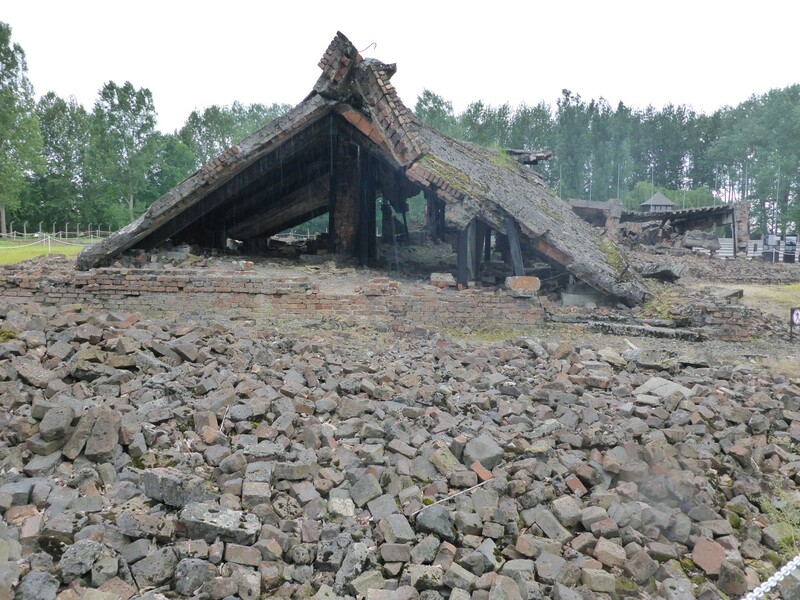 The gas chambers and crematoria, built on an almost industrial scale, had been blown up by the Nazis in an attempt to cover up what they had done. They had been left as they were found. 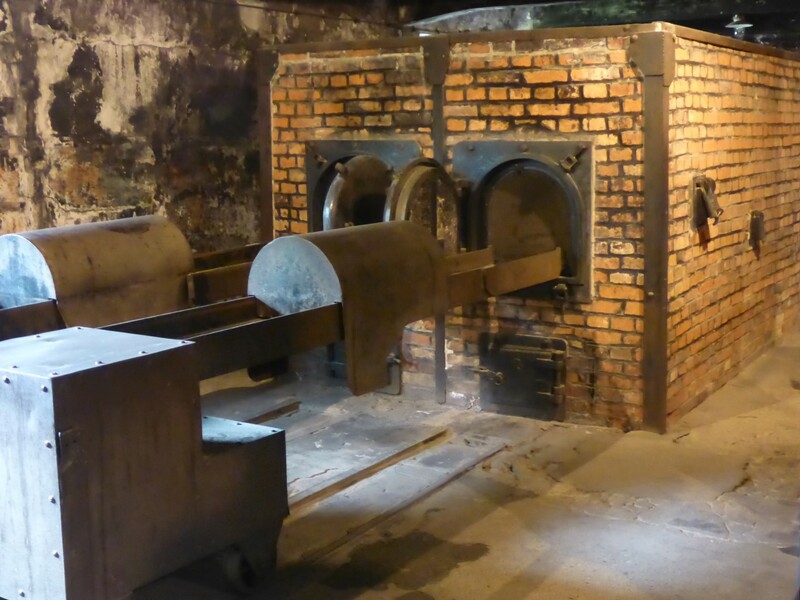 Photos of the gas chambers and crematoria taken by the Nazis. So my visit to Auschwitz was concluded with a bus ride back to the main camp. My ride back to Krakow was a sober one but slightly cheered by seeing so many people, especially youngsters, interested enough to learn what happened. We can only hope that such knowledge prevents anything like it ever happening again. 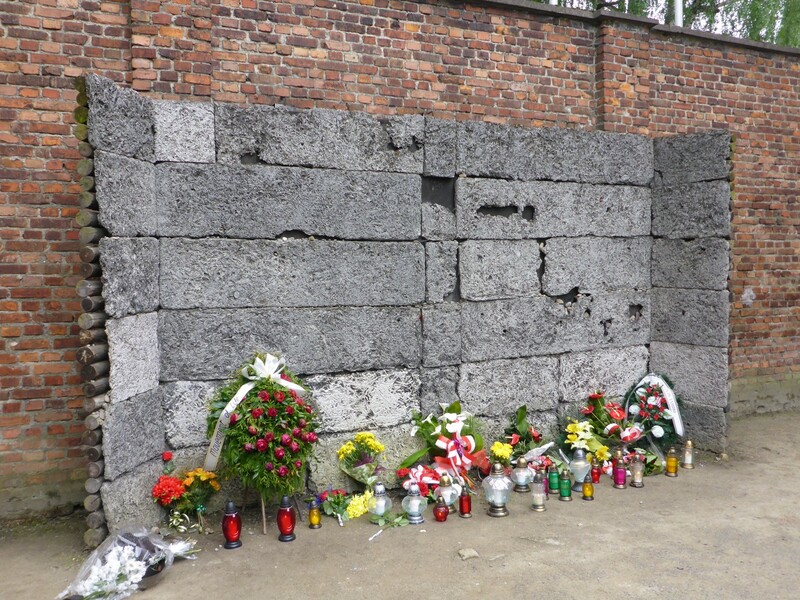 I visited Auschwitz in 1995, while on my first honeymoon. Ironic huh! I found that it was a very subdued atmosphere. Everyone walked around with a feeling of horror and ‘how could this happen’. I think it was the fact that one group of humans could purposefully attempt to wipe out a whole race of human beings with such organised precision. Essentially building a factory of death! I am very glad I saw it though, you can’t get the atmosphere in a book. Everything you say is absolutely right Jim.